Conservatism, racism, and white nationalism are not increasing. It's social liberalism that is taking over. 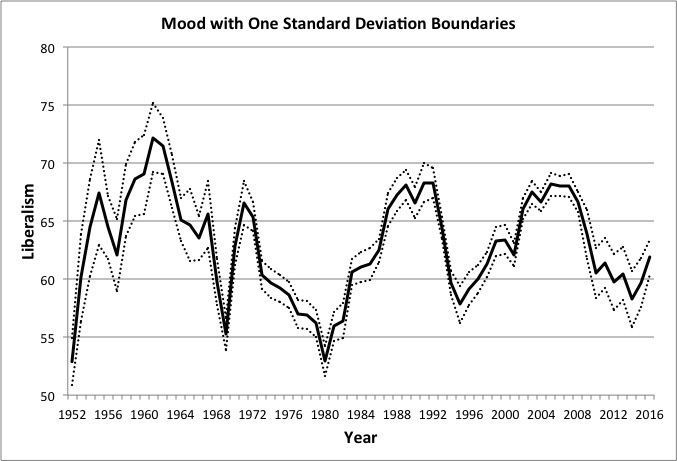 Policy Mood is basically an index of aggregate public support for having the government do things (see Public Opinion In America: Moods, Cycles, And Swings ). It is a statistical construct made out of a large number of survey items. Aggregate policy mood tends to be cyclical, acting as a thermostat relative to the policy being supplied at the time (Wlezien 1995). The public moved somewhat to the right through the Obama years, because he was supplying leftish policies. 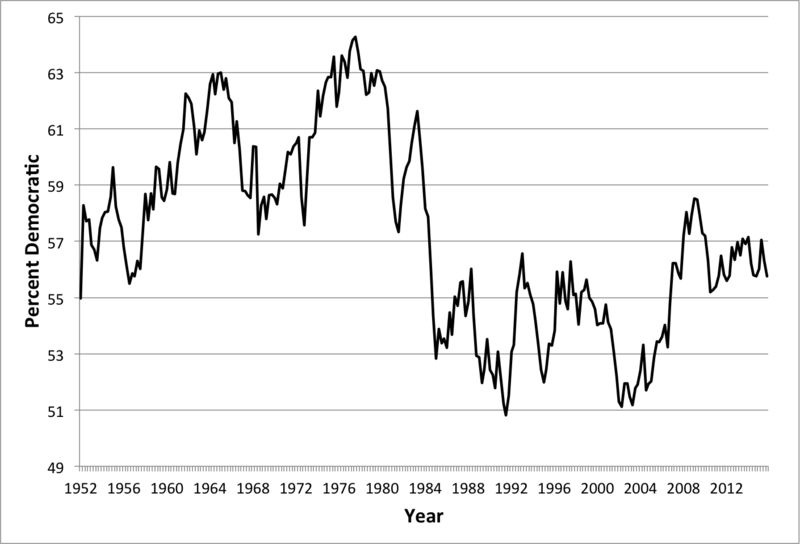 This is a standard finding and recent years represent normal fluctuations around the historical average. Macroideology is defined as the relative amount of self-identified liberals among self-identified liberals and conservatives. 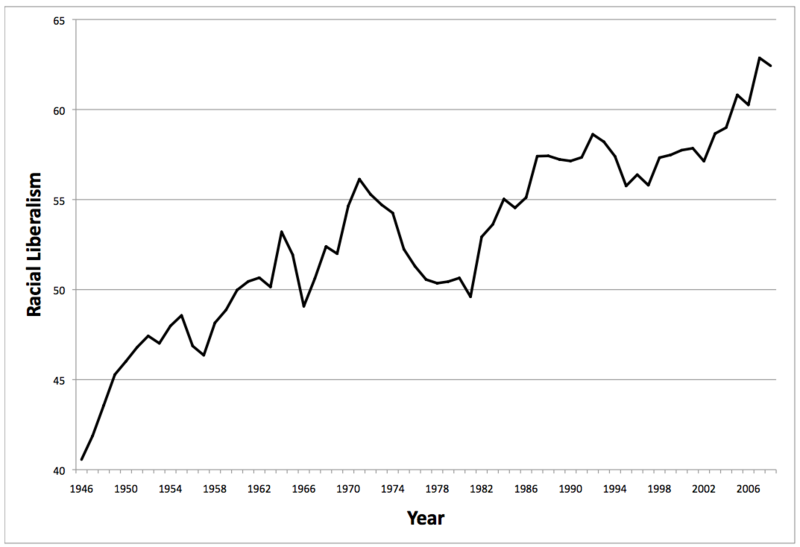 “Liberalism” has decreased over time substantially since the 1960s. But that’s largely symbolic. Here’s the story as told by Ellis and Stimson (2009). “Liberal,” as a positive identification, was basically invented by FDR. He introduced the language over his famous fire-side chats. JFK was the last President to self-identify as a liberal. Around 1966, “liberal” became a bad word. There was a substantial and sudden decrease in identification with the word, but not such a change in underlying policy preferences. LBJ’s 89th Congress passed a lot of liberal policies, including Medicare and the voting rights bill. There was massive funding to urban areas and, let’s just say, a lot of conflict. Whatever happened, “liberalism” took a negative charge. Macropartisanship is “the distribution of Democrats among Democratic and Republican identifiers.” Clearly around the 1980s there was a massive decrease in Democratic identification. There are a few factors at play there. The crux of the issue is whether or not the macro and longitudinal story is fundamentally altered by knowledge of micro distinctions. In general, we would answer in the negative. It is clear that the Republican growth in the 1980s, for example, cannot be understood solely as a phenomenon of the South. Or of the male diaspora. Or the replacement of New Deal seniors with Reagan youngsters. All these factors were important, to be sure. But almost all Americans responded, for example, to the bad news of the Reagan recession and even more to the good news of the subsequent recovery, to the Iran-Contra scandal, and to the economic fortunes and misfortunes of Clinton and Bush. To find one subgroup where, for whatever reason, the response was sharper is not a convincing denial that it did not happen everywhere. Young and old, northerners and southerners, men and women all reacted to the macro-political performance of the parties, shifting their partisan dispositions to reflect success and failure. 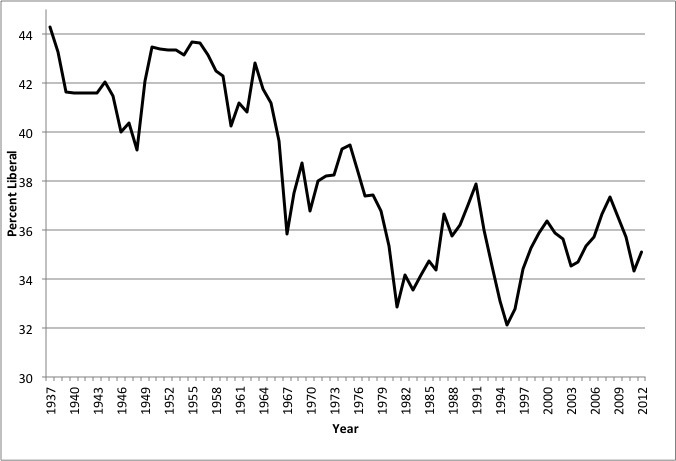 On social issues such as racial equality and gender/sexuality there has been a general and long-term increase in liberalism/leftism since the 1950s. This is pretty obvious if you think about it (de-segregation, gay marriage, marijuana, etc. 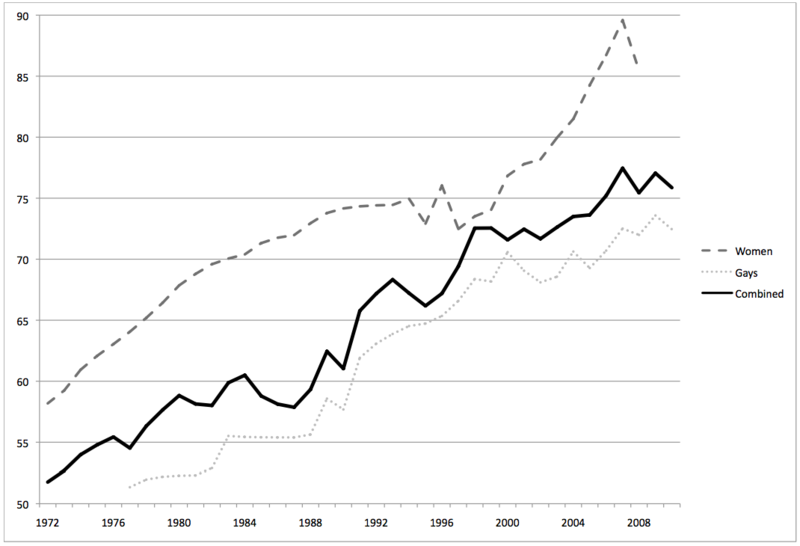 ), but here is some data from Atkinson et al. (2011) looking at policy mood by specific issue groups. 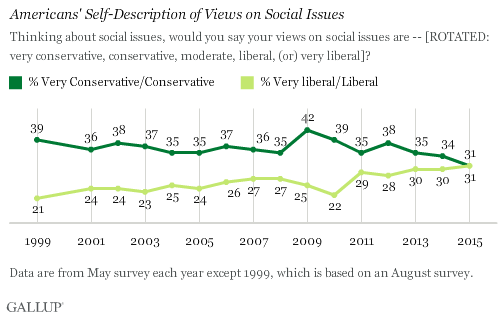 Even since 1999, the left and right have both become more socially liberal. Mostly among Democrats, but it’s even noticeable in Republicans if you subdivide the data (not shown here). 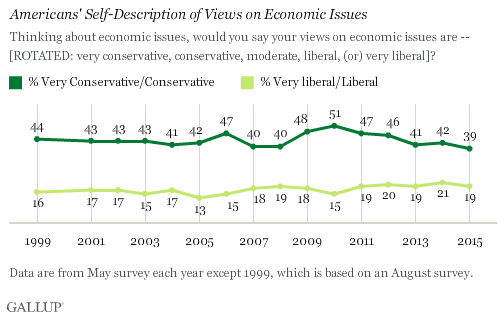 There is not much recent change in economic conservatism, however, which remains relatively popular in the United States. Let’s start with some basic descriptive figures for the far-right today. One article in The Guardian reports that a recent, national neo-Nazi summit in April brought out about 150 people. The infamous tiki-torch march by white nationalists in Charlottesville, on the evening of August 11, has been numbered around 100 people at the high end of the estimates. The larger rally, including a variety of other right-wing groups with varying ideologies, was numbered at about 500 (NPR). The Southern Poverty Law Center has the number of KKK members somewhere between 5,000 and 8,000 (SPLC). One recent poll suggests about 4% of Americans ‘mostly agree’ with the white supremacy movement (Economist). What about changes over time? Here is some data from the Southern Poverty Law Center (if anything, the SPLC would should biased toward finding increases, as their raison d'etre is the white supremacist threat). There is no overall increase or decrease in KKK groups since 2000. Some research by Leonardo Bursztyn of the University of Chicago suggests that Trump has made racists more willing to express their racism (Economist), but there’s no evidence Trump has increased the number of racists or the intensity of their racism. The American drift toward generalized social liberalism is masked in a confusing way by changes in how Americans use the term “liberal.” There is a weird tendency, especially since the 1960s, for Americans to describe themselves as more conservative than their actual policy preferences would suggest. But the socially liberal drift is even chipping away at this stigma on the term “liberal,” as lefties are now embracing the term somewhat more. But note that you can’t really say the United States has generally moved to the left in recent decades, because economic conservatism remains more popular and the changes on this front have been polarized by party. So conservatives who say the country has been taken over by lefties would be incorrect in this crucial respect. Finally, what about the “alt-right” and white nationalists, etc.? The appearance of a recent surge in right-wing ideology, from “alt-right” internet trolls to neo-Nazi marches, is an artifact of the most socially liberal cultural consensus the United States has ever known. There is no evidence of a surge or rise in these types of ideologies. It only appears that with Trump, several strands of the socially unacceptable right-wing have moved from extremely marginalized silence, to extremely marginalized public display. The sudden appearance of a very small quantity of something that is at a historically all-time low is likely to appear as a substantial increase. But it’s not. In the case of explicitly racist white nationalism, this appears to be what is happening. None of this says anything about how such groups should be dealt with. It seems fair to say that overt white racists have probably never been less numerous than they are right now. There is some risk that if Trump continues to foster this comfort among white nationalists, there could be some long-term resurgence of that ideology. But that’s only a hypothesis, and it’s not at all obvious. You could just as well hypothesize that the extreme cultural prohibition of far-right ideas has led to a long-term festering of ignorance, confusion, and resentment that is precisely what brought someone like Trump into office. You could plausibly hypothesize that letting white racists express their stupid and unconscionable viewpoints is the only real way to let them fizzle out via learning and socialization. But again, that’s only a hypothesis, too. This post has refrained from polemics (mostly), but it seems appropriate to add just one point. If sane folks on the left and right did nothing more than separate their hypotheses from the data, it could make a huge, positive difference in the direction of contemporary politics. Atkinson, M.L., Baumgartner, F.R., Coggins, K.E. and Stimson, J.A., 2011, June. “Developing policy-specific conceptions of mood: The United States.” In Annual Meeting of the Comparative Agendas Project, http://www.unc.edu/~fbaum/papers/Equality-Mood-Catania-June-2011.pdf. Ellis, Christopher, and James A. Stimson. 2009. “Symbolic Ideology in the American Electorate.” Electoral Studies 28(3): 388–402. Ellis, Christopher, and James A. Stimson. 2012. Ideology in America. New York: Cambridge University Press. Link. Erikson, Robert, S., Michael B. MacKuen, and James A. Stimson. 2002. The Macro Polity. New York: Cambridge University Press. Link. Murphy, Justin. 2017. 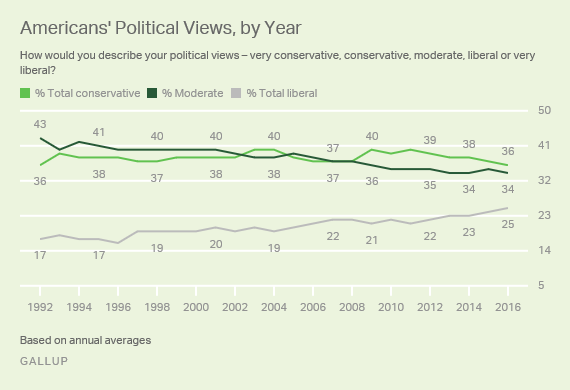 "Are Americans becoming more conservative or liberal (right or left)?," https://jmrphy.net/blog/2017/09/04/americans-conservative-liberal-left-right/ (December 14, 2018).